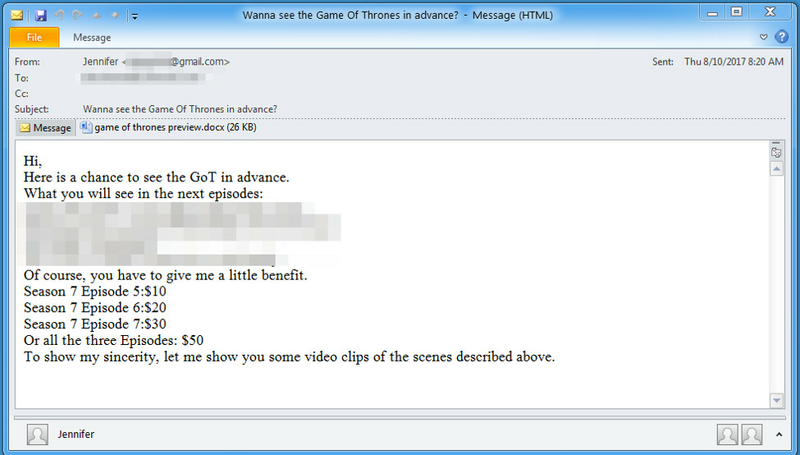 Hackers Are Exploiting The Promise Of Game Of Thrones Spoilers To Spread Malware. A report from cyber security company Proofpoint says that it’s observed a “targeted email campaign” that is using details of leaked Game of Thrones episodes to try and spread malware to unsuspecting users. Proofpoint says that similar attacks in the past have been attributed to groups associated with the Chinese government and that it’s possible that this attack could be coming from the same actors. At the end of July, hackers stole 1.5 terabytes of data from HBO, including contact information for the show’s stars, unaired episodes, and scripts, while an unrelated accident allowed a pair of episodes to leak to the internet earlier this month. Proofpoint isn’t saying that HBO’s breaches and these attacks are connected. The hackers behind these phishing attempts are using the leaks as a way to get people to click on and accidentally install their software, relying on natural human curiosity to carry out their attack. Next articleSome Facebook And Instagram Users Were Experiencing Outages Yesterday. Will Pakistan Be 8th Time Lucky? Mark Zuckerberg has been blessed with a baby girl!